I am obsessed with sock knitting. 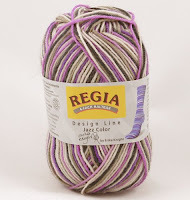 At any given time, I'm likely to have anywhere between two and five sock projects on the go, and my go-to sock yarn is Regia 4 ply. 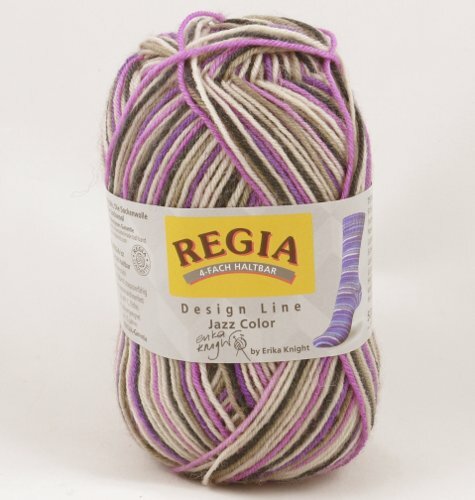 It's 75% wool, which gives it fantastic bounce and stretch - perfect for cables. The 25% polyamide makes it super strong, and it washes like a dream. I like to give recipients of my handknit socks a little of the spare yarn wound around a card, just in case emergency repairs are needed. An average pair of socks for a woman takes around a ball and a half, while a pair for a man takes around two balls, and at £3.95 per ball it's the perfect price for gift knitting. I love the plain colours for complicated lace and cabled socks, while the self-patterning shades are perfect for keeping more straightforward socks interesting. My partner loves his dark grey socks, and my grandmother was ecstatic over her bright blue cabled ones. I've even managed to get my sister hooked - she loves the Erika Knight design line. 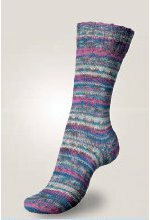 Socks are fantastic for knitters on the go because they fit neatly into most handbags and you can do a few rows here and there. 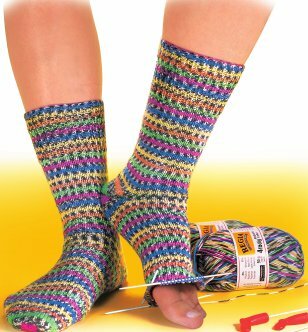 Before you know it, you have a pair of warm socks and it's time to cast on for the next pair. Post by Cayt in our Stirling branch.